On January 18, 2019, Manuel Brizido De Almeida, born January 17, 1930, was called to heavens pearly gates. 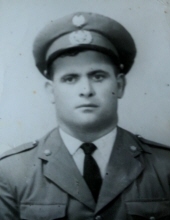 Manuel was born in Sao Paio Gouveia, where he lived until becoming a Lisbon Police Officer. He married Maria DeJesus Alves Cardoso where they had one daughter, Olivia . They moved to the Newark Ironbound Section in 1965 and had a son Kennedy in 1970. Manuel and Maria were together until her death in 2006. Manuel returned to his hometown of Sao Paio in 2016 until his passing. He leaves behind his two children, Olivia and her husband Tony and Kennedy and his wife Elizabeth, along with four grandchildren, Steven, Vanessa, Alexa and Ava along with various nieces and nephews. The Funeral Mass for Manuel will be held on Tuesday, January 29, 2019 at 9:30 am at Our Lady of Fatima Church, Newark. Entombment to follow at Holy Cross Chapel Mausoleum, North Arlington, NJ. Relatives and friends are welcome to attend. Visitation for Manuel will be on Monday , January 28th, from 7- 9 pm at the Buyus Funeral Home 426 Lafayette St.at Wilson Ave., Newark 07105. To send flowers or a remembrance gift to the family of Manuel De Almeida, please visit our Tribute Store. "Email Address" would like to share the life celebration of Manuel De Almeida. Click on the "link" to go to share a favorite memory or leave a condolence message for the family.